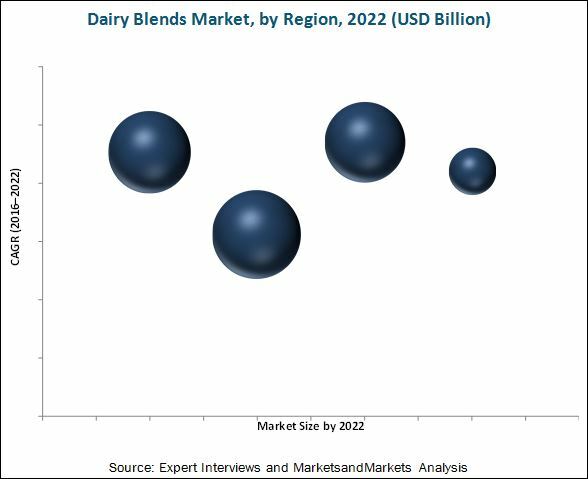 The dairy blends market is projected to reach USD 3.56 Billion by 2022, at a CAGR of 8.1% from 2016. Dairy blends have a significant impact on food products, in terms of maintaining the quality, flavor, and taste, which has led to its high-demand across the globe. This report includes the estimation of market sizes in terms of value (USD million) and volume (KT). Both top-down and bottom-up approaches have been used to estimate and validate the size of the dairy blends market and various other dependent submarkets. Key players in the market have been identified through secondary sources such as company financials magazines, journals such as Bloomberg Businessweek and, press releases, paid databases; their market shares in their respective regions have been determined through primary and secondary research. All percentage shares, splits, and breakdowns have been determined using secondary sources and were verified through primary sources. Key players in the dairy blends market are Fonterra Co-operative Group Ltd. (New Zealand), Doehler Group (Germany), Agropur ingredients (Canada), Royal FrieslandCampina N.V. ( Netherlands), and Kerry Group (Ireland), Maximum value addition of a product in the global dairy blends industry is observed in the product manufacturing stage. Value addition in the marketing and sales stages varies based on key players, addressable markets, manufacturing units, and end consumers. Key companies that offer dairy blends mainly invest in expansions through acquisitions and the development of new facilities. This research report categorizes the dairy blends market on the basis of type, application, form, and region. The market, based on application, has been segmented into ice cream, yogurt, infant formula, bakery, feed, butter & cheese blends, beverages, and others. The bakery segment accounted for the largest share of the market in 2015. Increase in health-consciousness, is fueling the demand for low-calorie bakery products among consumers. This is expected to drive the market for dairy blends as functional ingredients in this particular segment. Dairy blends are cost-effective alternatives to butter, with lower fat content, and do not have the negative impact on the taste of the products like margarine does. Hence, their demand in the bakery industry as a replacement for these two ingredients is increasing. The market, based on form, has been segmented into spreadable, liquid, and powder. The spreadable segment accounted for the largest share in 2015. The spreadable form is widely used as a substitute for butter and margarine, the demand for which was discussed above. This form has many applications in industries such as bakery, yogurt, ice cream, cheese & butter blends, infant formula, and feed. These factors are increasing the demand for this form of dairy blends. Despite numerous advantages of dairy blends, consumers are reluctant to use them over traditional dairy products. In few developed as well as developing markets, food & beverage manufacturers prefer to use butter, margarine, and other conventional dairy products instead of dairy blends. Concerns among food and beverage manufacturers towards dairy blends that they deteriorate the taste of food products is one of the challenge for the market. The market is characterized by high competition due to the presence of a number of large and small-scale firms. Acquisitions and expansions were the key strategies adopted by these players to ensure their growth in the market during 2011 to 2016. The market was dominated by players such as Fonterra Co-operative Group Ltd. (New Zealand), Doehler Group (Germany), Agropur ingredients (Canada), Royal FrieslandCampina N.V. ( Netherlands), and Kerry Group (Ireland).